Despite inclement weather, scores of Bahamas Technical and Vocational Institution (BTVI) students flocked to the institution’s recent college fair to gain information inclusive of scholarship opportunities. Present were Fanshawe College and Holland College, Canadian institutions, along with Bethune-Cookman University, located in Daytona Beach, Florida. This was in addition to the Ministry of Education Scholarship and Educational Loans division, the Organization of American States (OAS) and the Lyford Cay Foundation. “It was a one-stop shop where students learned what schools offer, but also what funding is available. These institutions weren’t randomly picked; they are a few of the colleges we are affiliated with through articulation agreements or Memorandums of Understanding,” said BTVI’s Student Affairs Coordinator, Racquel Bethel. “We want our students to also make a connection that BTVI’s credits are accepted at Canadian and US colleges,” she added. In spring 2014, three of BTVI students spent a semester at Holland College: Elkeno Jones studied Electrical Engineering and Ketley Brown focused on Information Technology, while Valentino Burrows was enrolled in the Energy Systems Engineering program. Rashad Morley also spent the semester studying Electrical Engineering at Vancouver Island University while Gerrard Russell was at Fanshawe College studying Information Technology and Security for two semesters. Meanwhile, Bethune-Cookman’s Associate Director of the Office of Admissions, Junell McCall said being present was a step in the right direction as her university does its part in higher education. “We recognize how important it is to educate people of colour and we want to expand our reach. We already have a healthy population of Bahamian students and we want to continue to offer our services to those who live abroad. We want to add to the Wildcats’ family,” she said excitedly. Meanwhile, the room was buzzing as students chatted with representatives. Office Administration major Aeisha Baker expressed excitement that so many opportunities abound. “The fair literally sparked a passion in me to expand my horizons. I see possibilities. BTVI is equipping us for globalization and mobilization,” said the 27-year-old. Furthermore, Electrical Installation student, Miguel Mackey stated that only because he attended the college fair, he is now aware of some of the scholarships and grants offered by The Bahamas government. “I learned about the technical scholarships available, which would lessen the burden on me. I don’t feel hopeless. I have a chance now to pursue my purpose,” said the 21-year-old who wants to study Biomechatronics. Kyle Ferguson, who is also studying Electrical Installation, described the fair as “refreshing,” adding that although he always achieves over a 3.00 grade point average (GPA) each semester, he has to work harder if he is to avail himself of the scholarship opportunities. 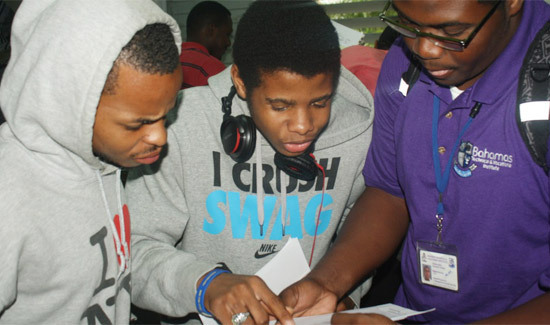 Caption: BTVI students discuss information received from one of the colleges present at the institution’s recent college fair.